Peristalsis is a wave-like movement (motion) that progresses along some of the hollow tubes of the body that have circular and longitudinal muscles, such as the intestines. 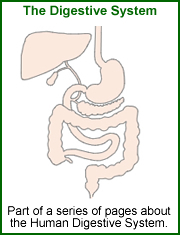 Peristalsis happens involuntarily and is induced by distension of the walls of the tube. Immediately behind the distension the circular muscle contracts. ... which pushes forward the contents of the tube.